What I cant work out here, were these his? Did he paint them? Or is someone infringing intelectual property rights by copying them? Isnt there a bit too much knee there? ha ha ha ha that donkey only has 2 legs...oh wait, that's not a donkey that's a MAN!!!!!!!!!! think I have a paint brush here that can be made from Claerhout Donkey Hair, I would have to check. Get it listed, without delay. ...and no one would be the wiser. Even better.... the donkey hair brush... that painted the donkeys.... And if u painted a donkey with the donkey hair brush.... you could call it A Claerhout Donkey??? Surely??? Have you noticed how tired those donkeys look, I think they been posing too much. those legs inspired me to get a tan. Wow where did u acquire that original materpiece? 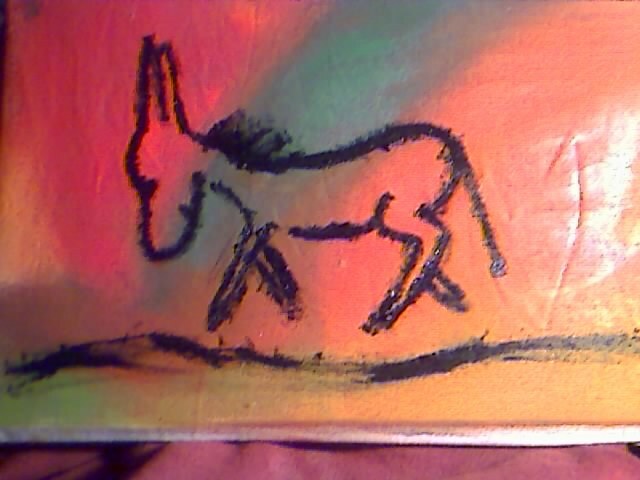 The Donkey inspired brush did it as if by magic. Tananka has got it all so so wrong ha ha ha . Ja, I did have, didn't notice who posted the painting, my most humble apologies, dear sir. I am so pleased with my work I cut off my ear.